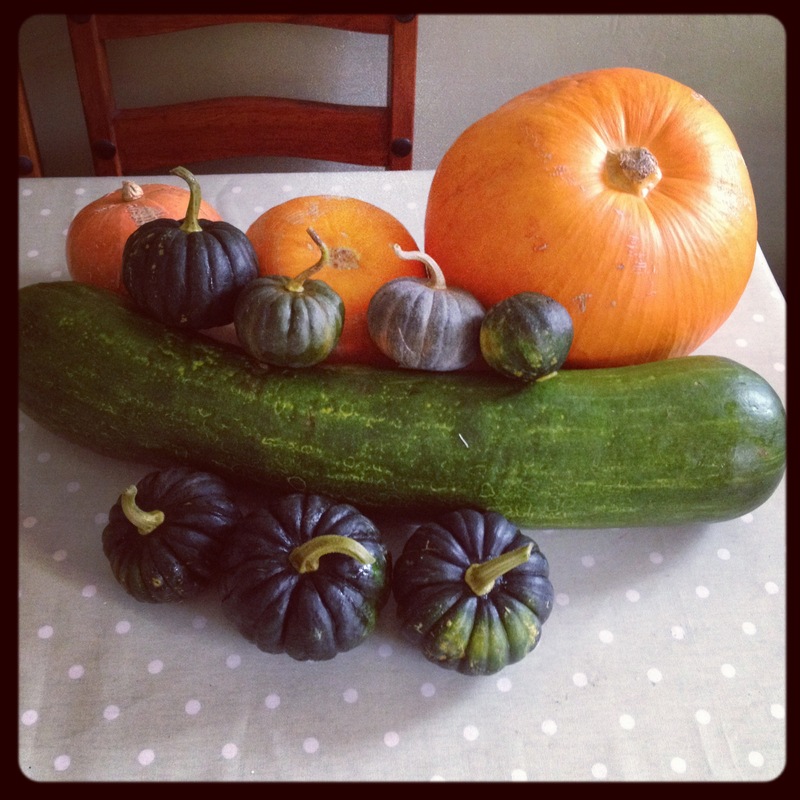 It’s that time of the year again, the sun is shining and the courgettes/zucchini just keep on coming! This relish has become one of my yearly summer recipes to get rid of use up a few of the many courgettes that come my way! I’ve tried various recipes over the last few summers and this is a combination of those. It makes a sweet relish that goes well in any sandwich containing meat or cheese, it would be perfect with hotdogs if you eat them. These days I don’t eat hotdogs but loved them growing up in America and even more so I loved the (bright green!) relish that we had with them. I believe we used to have Heinz sweet relish, something I’ve only found once in the UK. My label reading habit would now have me leaving it on the shelf if I did find it again and anyhow this version of relish is just as sweet but a whole lot more natural! 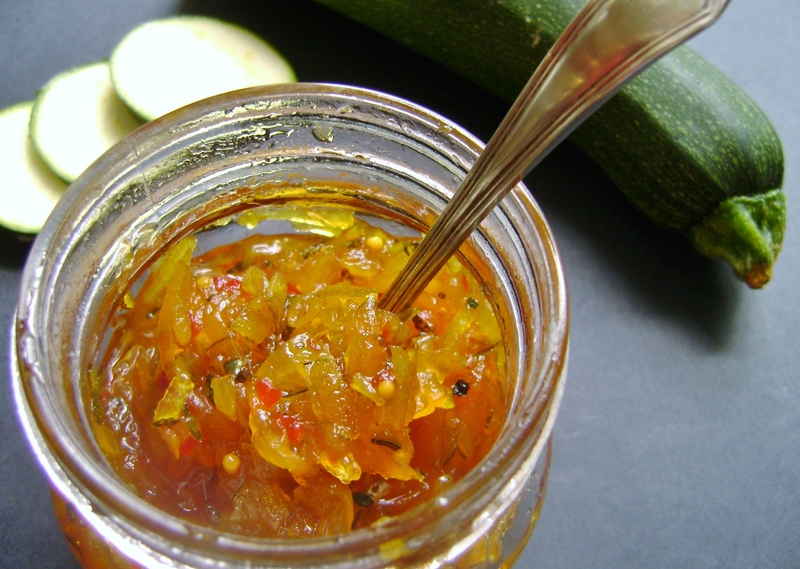 When the last jar gets finished, usually at the beginning of Spring I find myself feeling a little sad and believe it or not I momentarily begin to look forward to the courgette glut again just to make more of this relish! Grate the courgettes and finely chop the onions ( I use a food processor for this, much easier if you have one). Put both the courgettes and the onions in a large bowl and sprinkle with the salt, mix the salt evenly throughout, its easiest to just use your hands here! Cover and leave for a minimum of 2 hours or overnight in the fridge although beware of leaving it in the fridge as the onions smell very strongly. Drain the courgettes and onion in a colander, rinse well with cold water then squeeze out the excess water, again hands are best for this! Put the chopped peppers, vinegar,sugar and spices into a large pan, stir well. Add the drained courgettes and onion. Bring to a boil then reduce the heat and simmer for 30 minutes. You will get 5-7 jars of relish depending on your jar size. It rare for me to want to make or even eat soup in the summer. Rarer still we are actually having some summer like weather here which makes soup an even less likely meal! However I got to thinking of recipes for all the tomatoes I’m hoping for from the allotment and a request for tomato soup from my favourite 10-year-old resulted in this unseasonable recipe. This is a one pan and blend recipe, really quick and easy to make. It actually makes a great summer meal as there is little effort involved. Paired with a salad you can have a light, nutritious meal in no time. Preheat the oven to 200 c, 400 f, gas 6. Place the cut tomatoes, garlic and onion on a baking tray and drizzle over the olive oil. season with salt and pepper and scatter over the thyme. Roast for 30- 45 minutes until it’s all beginning to get a little charred. Tip the contents of the baking tray into a blender along with the stock and blend for a couple of minutes until smooth. If you don’t have a blender an immersion blender would also work. Season more to taste if necessary and serve. A swirl of cream added to the soup in the serving bowl makes a decadent finish. 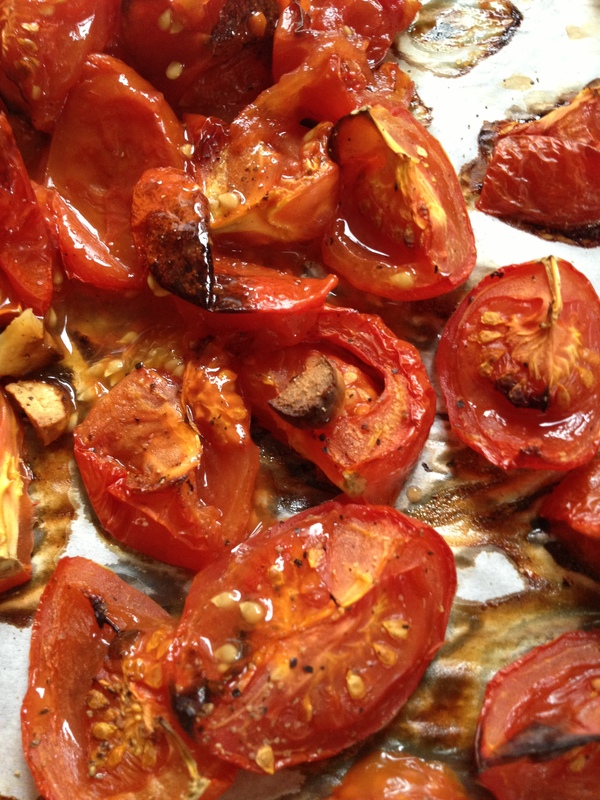 I prefer to use large vine tomatoes but any will do, the roasting really brings out the flavour. I’ve joined the kale wagon here, forgive me. Kale is very “in” right now. Being low-calorie, high fibre, rich in vitamins and minerals makes kale one of the latest “superfoods” and kale salads have been popular for a while now, I even posted one here. One of the first things to grow at my allotment this year has been kale, I hadn’t realised quite how prolific it would be and its only been big enough to pick for 2 weeks! Dont be surprised if there are a few kale recipes on here as it looks as if I’m in for a glut! I really like kale and quite like the heartiness it provides in a salad. I am aware though that raw kale may not be to everyone’s liking as it can be a little chewy! So recently when I began reading about people “massaging” salad dressing into kale, (that does sound a little crazy, I know!) I was intrigued. 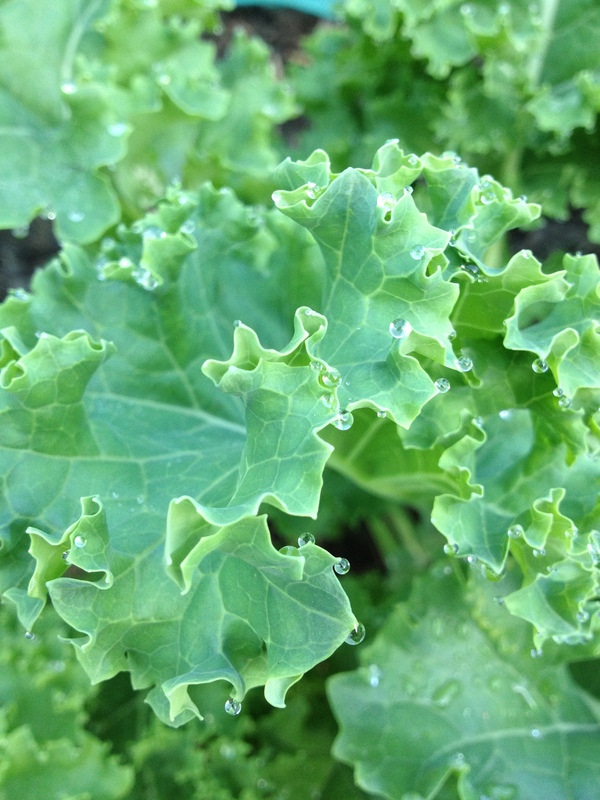 You only have to look at kale after its been watered to see how those leaves repel any moisture, it’s actually quite beautiful with the water droplets making little silvery balls all over it. So its easy to see that any dressing in a kale salad wouldn’t really be absorbed without a little help. All you do is mix your dressing and rub it into the kale leaves, the kale darkens as it absorbs the dressing. I think a quick rub is all the kale needs as my intention is not to lose all of the texture of the kale but just to soften it a little so one’s jaw isnt aching by the end of the meal! 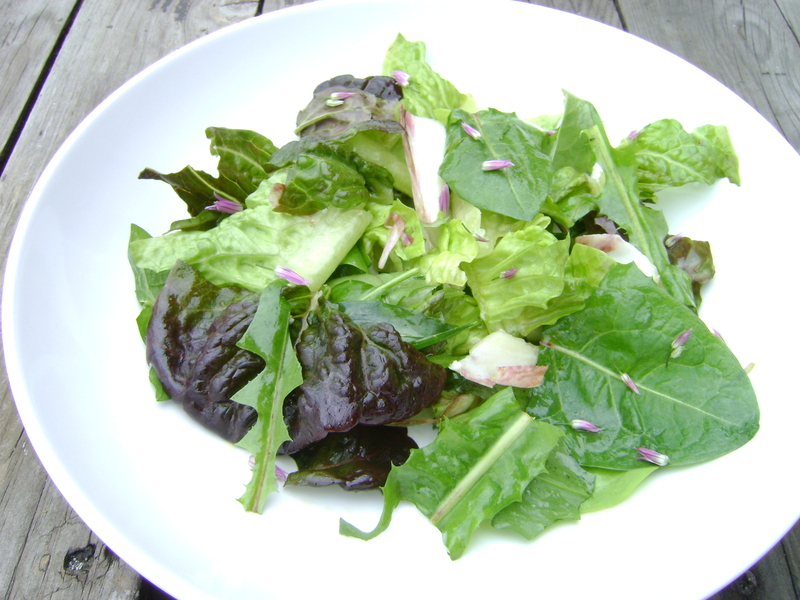 This is a really quick salad to prepare and provides a good healthy base for many accompaniments. I enjoy this salad with boiled egg or smoked mackerel, black olives also make a good addition. In preparation for my kale glut please do leave any kale recipe ideas in the comments section! 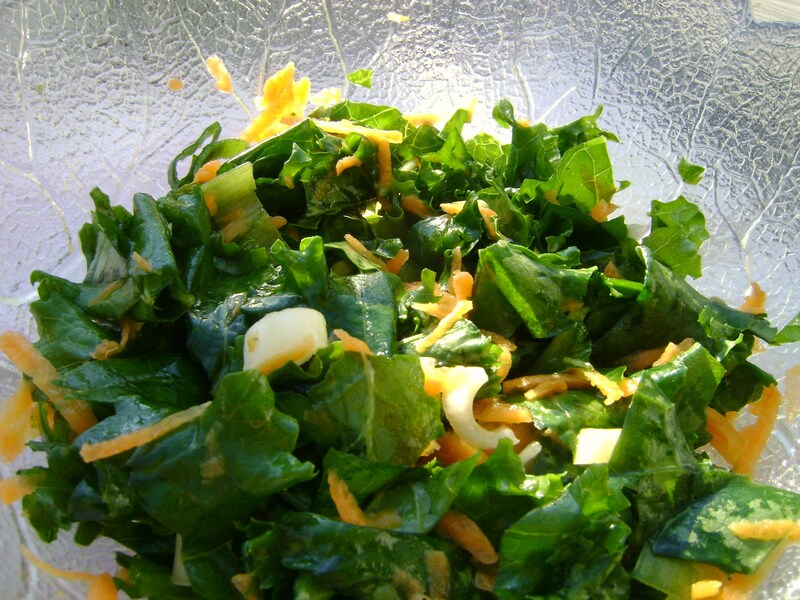 Strip the kale from its stems and roughly chop, place in your salad bowl. Whisk together the oil, lemon juice, salt and pepper until its well blended. Pour the dressing over the kale and rub it into the leaves, be quite firm using your thumbs and fingertips to “massage” the dressing in, stop after a couple of minutes or when the kale begins to darken. Add the onion and carrot to the kale, toss together. If not serving immediately chill until needed. Another day, another salad! I admit to feeling a little lost once my Whole30 ended and after a weekend break from it I did another 20 days as my all or nothing personality can follow the rules of something as strict as the Whole30 but once off it goes completely the other way! I clearly did not get rid of my sugar demon in 30 days! 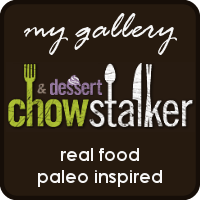 I have found that Paleo food suits me and the rules keep me on the right track, maybe one day I will kick that sweet tooth! So its back to salads for lunch but I will admit that one can have their fill of leaves! 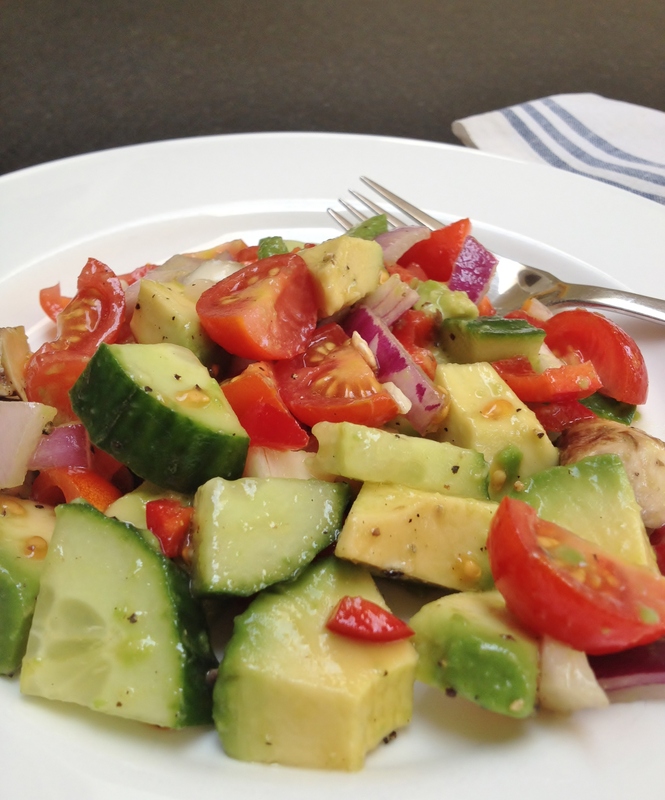 When doing the Whole30 avocado was on the list of foods to eat, such a treat! Wanting to make a leaf free salad for a change and finding a lonesome lime in the fridge led to this salsa-ish type of salad. Very un-salsa like I added a few mushrooms just to add a little meatiness, also just because I had them. I will admit it may have been a strange combination but I really enjoyed this salad, it was quick and easy to prepare and travels well to work in a Tupperware. It goes well with an omelette, prawns or chicken. coriander leaves, just a few roughly chopped. Chop all of the vegetables and add to a bowl. Whisk together the lime juice, olive oil, salt and pepper and pour over the vegetables stirring to coat. Leave to sit for a little while before serving. This is a new (to me) way of serving cauliflower. I had seen the term “cauliflower rice” used by foodies on twitter and initially thought it was cauliflower and rice! A little more investigation proved that it was a completely different way to serve cauliflower! The cauliflower is blitzed in a food processor until it resembles rice (more like bulgur if you ask me but it is small!). 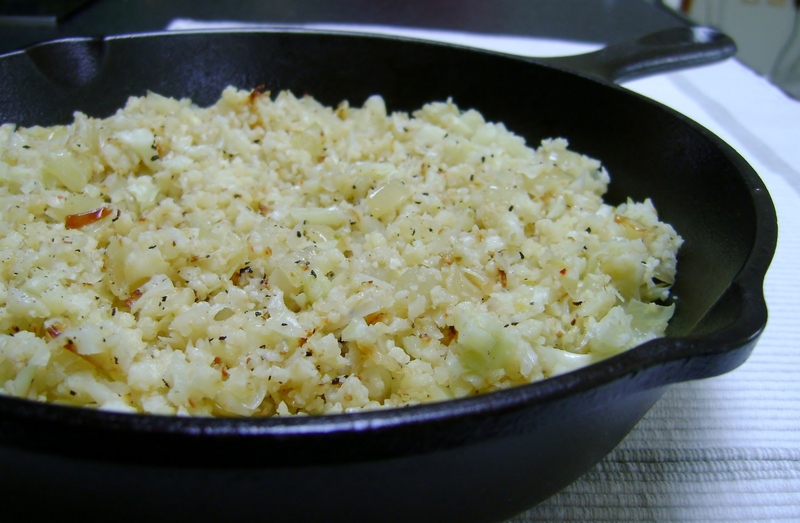 It wasn’t until I began my Whole30 that I decided to give Cauliflower Rice a try as a different vegetable side dish. Its fabulous and now my favourite way to serve cauliflower! There is something much more satisfying about the texture of cauliflower served like this to those of us avoiding carb side dishes, it really is like eating a bulgur/ cous cous type dish. I had read that cauliflower prepared this way bears no resemblance to cauliflower at all. I decided to try this out and made it without telling my brassica hating husband what it was, I thought the smell may give it away as there was a definite brassica hint but my husband didn’t seem to notice and was fooled into tasting it! I can’t say he was all that impressed but even he had to admit that he didn’t know it was cauliflower and I can’t believe he tried it, I think with even more herbs he may be tempted to try it again! I’ve tried adding various herb combinations and all have been good, it’s even good just straight up with garlic and onion. If like me you are dining on this alone it freezes and reheats well. Heat the oil in a large frying pan and fry the onions until translucent. Add the garlic and quickly stir until fragrant. Add the cauliflower pieces to the onions, turn down the heat a little and stir well. Cover and stirring occasionally cook for around 5- 10 minutes until the cauliflower has softened but retains some bite. Add any herbs you may be using, season with salt and pepper and serve immediately. 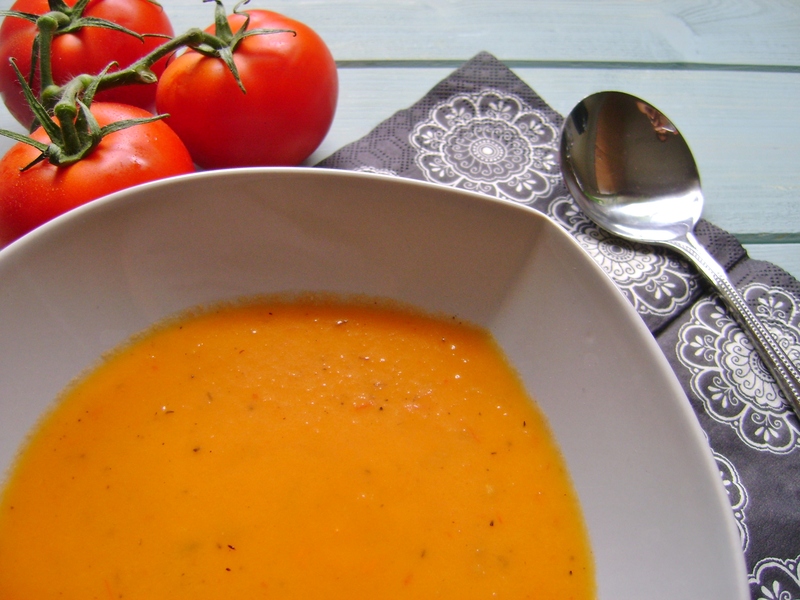 My friend, Liz, recently posted her recipe for Gazpacho. It looks wonderful but if I’m honest Gazpacho isn’t something I eat as I have an issue with cold soup. I confess I can’t really even bring myself to try it. I’ve had shots of cold soup while dining out which was fine and I wish I felt differently but a whole bowl, for a meal isn’t really for me. As I was reading Liz’ recipe I was inspired and found myself thinking that all of those lovely ingredients would make a great salad! Of course I’m not the first to have this idea but as salad is my go to lunch at the moment I thought Id try this idea out and I’m glad I did! It made a delicious, fast lunch. It was nice to have a salad without any leaves for a change! 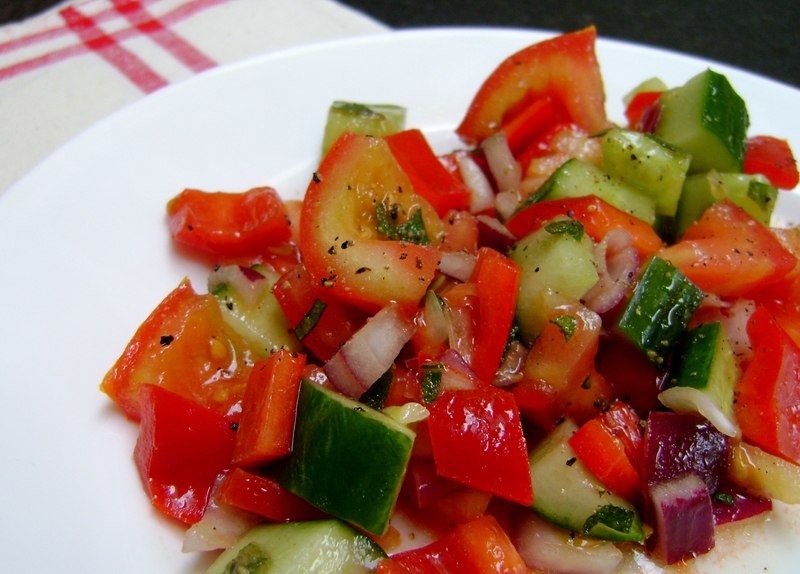 This Gazpacho salad is made in a jiffy! Chop all of the ingredients, whisk together the dressing and its done, you have the base of a meal in just a few minutes! I left the skin on my cucumber, partly as I like it that way but I also think the crunch it adds is nice. The chilli is to my taste, it can easily be left out or increased. I used oregano as it was to hand. I will try with dill next time but I think any fresh green herb would work. To get the maximum flavor from the tomatoes use them at room temperature. This is especially important at this time of year when tomatoes are decidedly less tasty! Tomatoes stored in the fridge have no flavour. I had salmon with my salad but this Gazpacho salad is the perfect side to fish, prawns (shrimp), chicken or bread! First assemble the ingredients for the dressing. Peel and smash the garlic clove and put into a jug or jar. Add the olive oil and vinegar and leave to sit while you prepare the rest of the salad. Chop the rest of the salad ingredients and add to a bowl. Fish the garlic out of the olive oil and discard. Add the salt and pepper and whisk together. Pour over the salad ingredients in the bowl and stir well to cover all the vegetables in the dressing, check for seasoning and add more salt and pepper to taste. Serve at room temperature accompanied with bread, salmon, chicken, or prawns (shrimp). This time last year I stumbled upon a challenge that really appealed to me. It was called the Urban Farm Challenge, a monthly blog challenge encouraging a simpler lifestyle relying more on local, organic (if possible) foods and making and growing your own food, even for city dwellers. It was to be a year of learning useful house-holding skills. I have always lived in cities but love the idea of country life and over the years have dabbled in growing my own vegetables and canning my own jams and chutneys, often from that home-grown produce! This challenge was just a step further, there was cheese making, foraging, making herbal teas and tinctures. I just loved the idea and got the book for my birthday, I love this book! Its co written by Anette Cottrell and Joshua McNichols, two of the most inspiring people! Both have families and are trying to live without supermarkets and the book is full of tips for gardening, composting, growing, preserving, city farming. 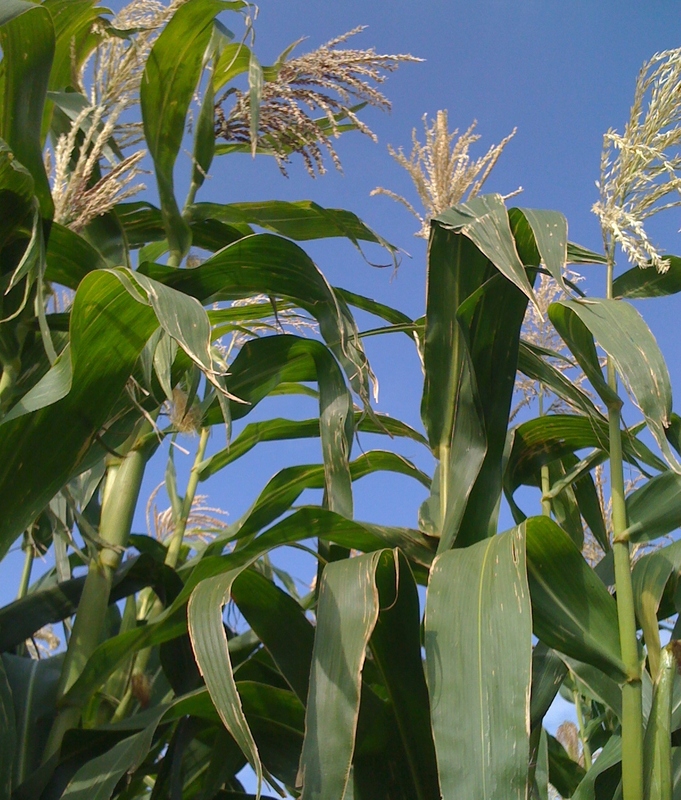 There is advice on sourcing your own food suppliers, grinding your own grains. I loved this challenge and took part in most of the challenges although I must admit I was a bit of a fair weather partaker and did less of the winter challenges. 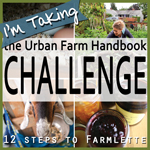 Here is my round-up of my Urban Farm Challenge over the last year. February: The challenge was soil improvement. I was late to the challenge but quickly ordered a composting bin with hope of making my own compost. Unfortunately the bin that arrived was huge, to big for my city garden so I donated it to a friend with an allotment and looked to the next challenge! March: The challenge was home dairy, this was the challenge that I was most looking forward to! The idea of making my own cheese was completely new to me but I dove in and made lemon cheese, ricotta and mozzarella. 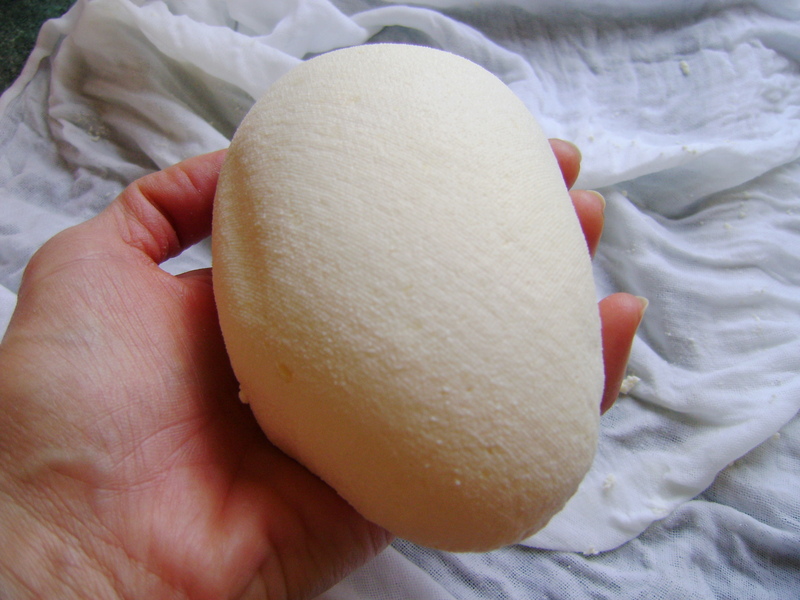 I have made my own cheese several more times throughout the year and am inspired to try more, I’ve found this to be an area that I really want to explore! April: The challenge was gardening and sowing your own seeds. Easy for me as I grow some type of vegetable each year. My Mother in law has an allotment and takes care of the plants for me, it’s an unbelievably lucky outcome for me and I’m so grateful to her for this! Among the regular vegetables I grow I also tried some different things as part of one of the challenges. I managed to seek out collard greens, not successful at all in the cool, wet summer we had,the snails got to the only tiny plant that survived! I also planted endive (chicory) another fail! The black futsu and Naples long pumpkins were much more successful as were the yellow courgettes (zucchini). May: The challenge for May was foraging, not as easy as I thought! I’m too scared to try to find mushrooms on my own but I did make a dandelion salad foraged from my garden, I will admit that dandelion leaves are not the best thing I ever tasted but I am glad I tried! 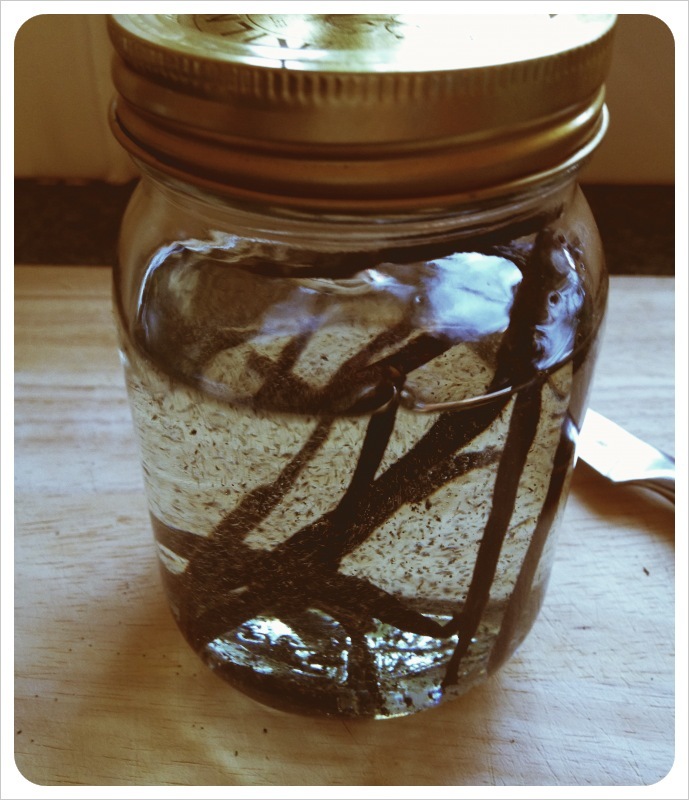 June: This month the challenge was botanicals and all about making your own tinctures, balms and herbal infusions. I made chive blossom vinegar which I look forward to making again. I really wanted to try to make my own lotions but am a little ashamed to admit that I still have not tried this, maybe that will be one of this years “to try’s”. July: Seed saving and looking forward to winter was the challenge this month, I did not take part as nothing was in flower yet. Due to the awful weather we had last summer everything was behind. August: It was preserving this month, something I do each summer anyway. 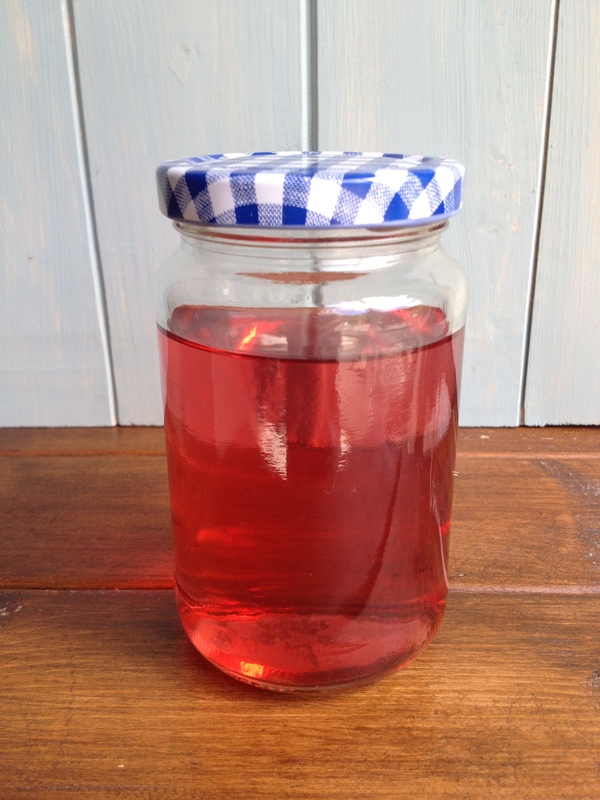 Small batch canning, cold storage, fermentation were all available to try using summers bounty. I always make jams, jellies and chutneys and last year was no different. 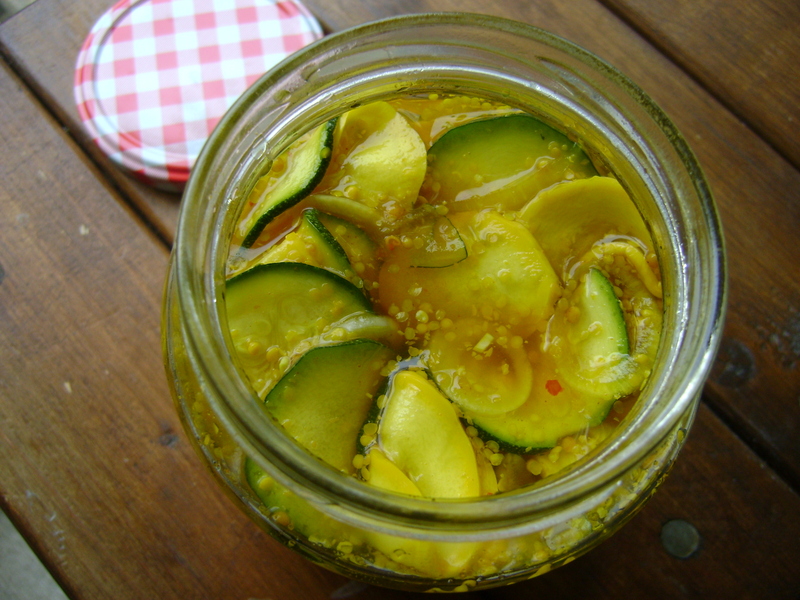 Here is a selection of what I made pickled courgettes, peach pie preserves (so good!) and I tried fermentation with cucumber kimchi. September: It was all about bartering this month, and swapping ones goods for those of another. One of the possible challenges was to hold a food swap, I love the idea of this and maybe one day I will try to arrange one, I just need to find enough fellow canners and growers! I don’t mean to go on about the awful summer we had last year but due to this I found I didn’t have an abundance of anything! I did manage one swap with a friend that had a bucket of plums for which I swapped some very large squash. October: Protein was the theme this month, and we were free to choose our own challenges from hunting to growing your own beans. Time escaped me this month and I didn’t get around to taking part. November: The challenge this month was about grains, using whole grains and even brewing with grain mash! This was a crazy month and despite my best intentions once again I missed this one, although using whole grains is something I try to do anyway. December: This month handcrafted holidays was our task. With the recession this is something I have been seeing more and more of and I love the idea of this. I made my own vanilla and lemon salt to give as gifts. One of the gifts I had most fun with was to make up a basket and fill it with jam, chutney, lemon salt and vanilla I had made. This was a very successful, my friend loved her gift! January: This was the wrap up month, but it was extended to February which is why I’m doing it now. I had a great time with this challenge, I loved reading the book and trying new things. One day I hope to have a house with a little land where I can fulfill my Little House on The Prairie lifestyle dream! For now I will carry on enjoying some of the skills this challenge has taught me and hopefully pick up some more. Many thanks to Annette for organizing this and all the hard work she put into it, I had a blast! You are currently browsing the archives for the Vegetables category.